Most people go to Starbucks to get a cup of coffee -- or at least a drink with a coffee-like name. But if you're there often enough, you'll be tempted to buy the simple sandwiches, cake pops, and other pastries for sale -- but where does all that stuff go if it doesn't sell? Well, now, to a great place: to people in need. Building on an existing collaboration with Food Donation Connection and establishing a new partnership with Feeding America, Starbucks plans to provide almost 5 million meals to individuals in need this year by simply giving away all its unsold food. Though the concept may seem like a no-brainer, US food safety policies require baristas to throw away all refrigerated items past their expiration date, even if they're still totally safe to eat. 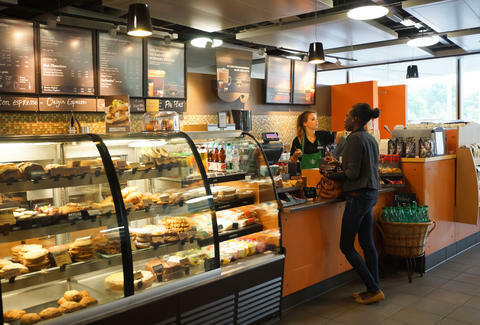 But through research and quality-assurance testing, Starbucks figured out a safe and legal way to get over these hurdles, and the FoodShare program comprising 7,600 US-based stores was born. Starbucks has been donating its pastries since 2010, but the new program expands on the goodwill to include everything. "Our hope is by taking this first step, other companies will see the possibility for their participation and together we will make great strides in combating hunger," Group president of US stores Cliff Burrows said in the statement. As Marie Antoinette definitely did not say once, "Let them eat cake pops." But now, Starbucks is letting people do that. And those leftover ham & swiss panini, too. Kara King is a News Writer at Thrillist and eats a lot of Starbucks croissants. Send news tips to news@thrillist.com and follow her at @karatillie.